I am so sorry that you and her family have lost a dear, dear friend. She was wonderful for you, and I know for many others. I think anyone who ever met Ida was impressed by her gentle spirit. Just a beautiful story. Thank you. I remember fondly the time I got to hitch a ride with you and stay at Ida and Harry’s house. I still giggle when I remember Harry telling me if I wanted to ride in the buggy, I had to catch a horse first, and the little barefoot boy who had to go get one for me because I failed at my attempt. I so enjoyed that time with you and your sweet friends. God has two faithful servants in Heaven with Him. Thanks for sharing, Ami! Hugs to you! Caron, those were fun times indeed! That little barefoot boy is all grown up now, I’m sure. Touchingly beautiful. What a legacy. Thank you for commenting. She was a very special friend. I am so sorry for your loss, Ami. I will be keeping you and Ida’s family in my thoughts & prayers. How touching, Ami! I’ve known this story from you telling how you started but this post is such a nice tribute to Ida and the Amish! Thank you for sharing that with us Ami. What a lovely memory to have. Ida is in wonderful company. My dear father-in-law went to glory late last Wednesday night. I converted my M-i-L to a quilter years ago… So he’s pre-trained in picking threads off people, should the need arise! Ami– Ida’s lovely gift to you lives in the many new quilters you have taught as well as the in the money AAQI has raised. It is unbelievable to me how one simple gesture can have such a profound impact. I am sorry for your loss and grateful to you for the reminder that my impact in life can be simple to be effective and profound. I will pass this on to my children. Alice, thank you for your comment. You made me all warm and fuzzy inside. Isn’t it wonderful how one person can make such a huge difference, by sharing their love and talent, to some many people? I’m not particulary good at quilting but have decided to make 24 quilts for our new Veterans Homeless Shelter in South Bend, IN. I told some friends, who told some friends, etc. that I needed cotton material for this project and the out pouring has been awesome! Not only will those Vets get quilts, but am now also making quilts for the 18 beds for our local shelter for victums of abuse, called Polly’s Place in Niles, MI….it is struggling financially and needs our help………..what a blessing to have so many care so much……for someone less fortunate than themselves! When given the chance, most people can be overwhelmingly generous! Beautifully said, Alice! You have managed to put into words what I felt but could not articulate so well. The visual image was the drop in the pool causing ripples. Ami – Hugs to you as you mourn the passing of Ida. What a blessing she was for you, and in turn for all of us. You’re so sweet, Julie. Thanks for your kind words. This story touched my heart. I wish when those life-changing moments happen in our life there would be trumpets playing in the background so I would remember the smells, sounds, sights, and everything about that moment for the rest of my life. But, alas, it is only by looking back at our lives carefully can we realize what moments changed our lives drastically. Thanks for this memory. Thanks, Charlene. Time always plays a part. After all, IN the moment how do you know it will change your life until you life changes? That just makes me cry. You were blessed to had had her in your life, and she, you. Yeah…made me cry too. Blessed indeed. A life changing story. Heartwarming. Sharing your experience of how the moments that change our lives come without warning is a reminder to live in the present and to treat it as such, an unexpected gift. Thanks for sharing that gift with us. How difficult to lose such a dear friend as Ida. My sympathy to you, as even we know that Ida is so happy in Heaven. You surely were blessed to have her in your life. Thanks for a beautiful story. What a beautiful story. You and they were blesssed to have you in their lives. Ida lives on in the quilters she has touched and taught as well as through you and your own legacy. Thanks for sharing your memories so we all can see that truly our lives are defined by our simple gestures and moments of kindness. Simple gestures and moments of kindness……we all need to remember this. Thank you. Thank you Ami for sharing your life changing experience with us all. You have changed many lives as a result of your time with Ida. You were blessed to have a quilting teacher who gave you encouragement and friendship. I’m truly sorry for your loss of your friend and mentor. Vicki, thanks for your kind words. What a sweet and touching story. So sorry for your loss, but so happy for that moment that forever changed you like. Just think – if you had not met her, so many of us would never have enjoying you, your quilting, and your sense of humor. If I hadn’t met Ida my life would have turned out pretty dull. God bless Ida’s family, including you as you mourn her loss and celebrate the legacy this lovely woman created, simply through patience, kindness and a gentle disposition. Often too much time is spent on legacies of the rich and famous, when in reality, people like Ida touch the lives of others in greater depth. Thank you so much for sharing this wonderful story. Lessons we can all learn. Very well said. Ami, you have been truly blessed with two beautiful women to guide you through life’s journey. I am sure that your two angles are in heaven singing your praises and sharing their “Ami” stories. Thanks for sharing your stories of Ida and your Mom. I’m so sorry for your loss. Thank you so much for suggesting that those who wish do honor her can make a contribution to the AAQI. Ami, thank you for sharing. You are fortunate, indeed, to have had Ida in your life, and to have maintained contact with her. We are all indebted to Ida – the ripples of her influence extend to us all. And your sharing your story has undoubtedly influenced many of us to pause and examine our own defining moments. May blessings abound. Indeed I was so very lucky to know Ida. This is such a lovely tribute to your friend. Thank you. We all have quilting Mothers, Grace Buchanan was mine. I was eight years old or so, together we made a doll quilt, by hand. I used squares from her stash. I heard over and over, that’s not good enough, you must take it out. She quilted it after the top was done. We owe our gratitude to all our fore-mothers, related by blood or happenstance. Such a wonderful and inspiring story. Like you said, you never know when that person, event or moment will change your life forever. It certainly sounds like you got the “right directions” from Harry, Ida and all the others who have helped to shape your journey. I appreciate you sharing this gift with so many quilters and regular people around the world. You have made your own impact, Ami, and for this I thank YOU! What a wonderful story about a wonderful woman, who meant so much to you. Thank you for sharing. Thanks for reading my blog, Jane. Thank you for sharing your beautiful story. Ida was lucky to have you in her life also. Ami, what a beautiful tribute; it brought tears to my eyes. Thank you for sharing it. I’m sure Ida still feels your love. Your words made me pick up the phone to call a dear senior friend of mine to say hello. Thanks for sharing this story, and the gentle reminder to treasure our friends. What a beautiful tribute. Thank you so much for sharing! I am going to pass it on to the ladies in my charity knitting/crocheting group (called Mother’s Hugs) so they can see how important each stitch they make really is. Hugs and prayers for you. Ami, Ida’s gift to you was not just her teaching you to quilt, but also her gentle and loving encouragement along the way. Her support gave you a new medium in which to express yourself. That world gave you opportunities to share your humor and joy with others. Her example allowed you to then be encouraging to others as they began their journey. And through your reaching out to others you have created a way to share your family’s struggle with Alzheimer’s and now you are able to help others in a way I know you never envisioned even 10 short years ago. We all have an effect on those we meet in this life. It is how we choose to share the blessings He gives us with others that let’s us truly touch others in a positive way. He sent you to Ida for a reason and her faithfulness to Him as well as her affection for you will always remain as an example to her family on how to live a life of integrity, love and openness to those they meet. My prayers are with you as you both mourn this wonderful woman’s passing. p.s. – Think what a kick she and your mother must be having sharing stories about you. So true, Melissa. Loved your PS. So sorry for your loss of Ida. I read about some of your quilting start in How NOT to Make a Prize Winning Quilt. It was the 1st quilt book I ever read. I will say a prayer for all of Ida’s family & for you. Ami, please accept my sincere condolences on your loss, and know that because Ida taught you to quilt, you taught me to quilt an applique through your classes and books. My thanks to both you and Ida. We are all connected, aren’t we? Ami, I first fell for Ida in your “how NOT to make a prize winning quilt”; that book made a difference in my life.Three cheers for Ida in your life. Godspeed to you and Ida’s family, and Scooter, of course. Ida’s left a legacy thru you to all of us that you have inspired in quilting. May God bless her soul. I’m so sorry for your loss of such a good friend and inspiration. Thanks for your kind words. I’ll miss her a lot. What a lovely tribute you a dear friend. And now the rest of “your” quilting friends have gained from all you learned with her help. What a wonderful tribute to a lovely woman. She sure was someone very special. Pass the tissues box, please. Such a beautiful and moving memory. What a beautiful post. Made me laugh, and then cry. This goes in the all-time best posts lists. Lordy, 98 grandchildren? That’s astonishing. My condolences on the passing of your quilting mentor. Huge family. Ida knew them all, their birthday’s, etc. What a beautiful tribute, Ami!! I hope Ida knew that she touched millions of quilters worldwide! I know she got a kick out of all the quilting stuff I do. So sorry for your loss. What a wonderful tribute to your friends. You have my sympathies and prayers. It is always difficult to loose a friend and mentor. I know Ida was proud of the legacy she left by teaching you the quilting and life arts. Rejoice in her spirit and hold those memories dear. What a beautiful memorial to Ida! I remember you writing before about your experiences with the Amish, college and learning to quilt. Thank you for sharing with us. Yes, the keyboard got a little wet. Ami, I am sorry for your loss. What a beautiful tribute to a remarkable woman. God bless you. (((Hugs for Ami))) What a wonderful treasure Ida’s friendship was for you. Do I remember correctly that you wrote a book about your Amish experience? Are you going to do a quilt of your car going up a country road to a barn raising, or you and Ida at the quilt frame? What an amazing experience you were given such a long time ago. Lila, my thesis was never published. And no plans for a car quilt, but that’s a good idea! We all should be so fortunate to have special moments and special people in our lives. You were blessed with Ida. Your kind words mean a great deal to me, Yvette. What a wonderful tribute. Gone, but not forgotten into the arms of eternity. You were lucky to have had her in your life. We are lucky you had her in your life, too. it’s wonderful that one person touched so many lives. what a gift we all have been given. Our world is getting smaller and smaller as people connect and go out with their experiences and friendship to share. Ami, you have enriched and influenced so many people as a result of your “adopted” family and their way of life. Thank you for sharing! Take care of yourselves in this time of sadness and memories. It’s been fun remembering and sharing. Thank you, Ami, for sharing this lovely story. My thoughts and prayers are with you and Ida’s family at this sad, but joyous, time. What a wonderful story! You are very fortunate to have such touching and beautiful memories! It certainly brought a tear to my eye, experiences like yours are truly heartwarming. and isn’t it wonderful to know that, in a likewise manner, you continue to carry on her love of community, service and sewing with your circle of friends – she leaves a huge legacy, through you! What a lovely story and to have lived a part of Amish life must have been an enchanting experience that many of us envy I am sure. It was pretty fun for me, but it’s not an easy lifestyle. What a wonderful story.. She passed her legacy on to so many through you. You were lucky to have such a soul in your life. Blessings. Sorry for your loss but what a wonderful tribute to your friend. It has brought to my mind my first time of quilting. I was invited by my girlfriend to go to her mother’s house (I was in high school). In her dining room was a large frame and many women sitting around the frame and quilting, I was asked to join them, like you were and the adventure had it’s start. My Mom became a quilter and year after she was gone have also gotten into quilting, Thank God for all the teachers who has taught us all how to quilt. Quilting is pretty fabulous, not just the art, but the women (and men) who push the needles around. Good people! Sorry for your loss. I’m sure Ida is up in heaven quilting with my Judy, the one who changed my life with quilting. Hugs. Thanks to everyone who shares of themselves. I was in tears when I finished reading this. What a blessing to have had her in your life for such a long time. Hugs to you and her family (think how long that would take). I am so lucky to have known Ida. How lucky you were Ami. What a priviledge to join the community and make such a friend – and how fortunate for the world of quilting.Thank you for sharing in such a moving piece. How lovely that Ida lives on in your quilting skills. Another lesson on pursuing life outside your comfort zone. There are so many people and places waiting for us to discover…if we just take that chance and make the best of it. Thank you for taking that chance and sharing your story. There is so much to learn and treasure in this great big beautiful world of ours. That is a beautiful story and you are such a fortunate woman to have such strong people in your history. Your story is as beautiful as you are. Thank you for sharing and remembering your special friend. What a wonderful tribute to your dear friend and mentor. Ida was a wonderful, gentle, caring soul who touched the life of a young girl, who has since touched thousands of lives. We owe her a debt of gratitude for teaching you to quilt. One simple caring act can have a profound affect on a young person’s life. Thank you, Ida. You are in my thoughts and prayers as you say goodbye to a dear friend. Norma, hugs back to you. Thanks for your kind words. What a beautiful tribute! Cherish your memories! What a wonderful tribute Ami. It brought tears to my eyes and I’m not one who is easily brought to tears. Here’s a hanky….. thanks for your kind words. Lessons learned that you still share with your quilt sisters. Peace & blessings to you always. Her kind and patient gesture (imagine letting someone bleed on your quilt!) continues to teach: A simple act of kindness can ripple out and who knows where it will reach? Thank you for sharing this lovely tribute. I know. How many of us would do that?! How wonderful for you to have had that joyful experience in your life and how generous of Ida and family to make you a part of theirs. You had to have been her favorite student !! Dorrie, thank you for your hugs and prayers. I sure am lucky to have had so many wonderful experiences. What a beautiful story of friendship and how much it can make a difference in our lives. I’m sure that Ida is now in heaven and that you’ll meet up with her one day. Just don’t make it too soon cause we need you here! Thanks for sharing! And now Ida is quilting up a storm with all the friends and family that were waiting for her. I think there is no more fitting tribute than the one you just gave Ida, a woman who took time to show a young lady how to create beauty with a thread and needle. What a lovely tribute to Ida. God rest her dear soul. My Aunt Evelyn introduced me to quilting when I was a teen. Like you, it was a life changing moment that set me onto the wonderful path of being a life-long quilter. I will forever be grateful for her teaching and inspiring me to quilt. She passed away just this past March. I made a point of telling her 2 daughters how much Aunt Evelyn meant to me…and my quilting. Thank you for sharing your love for Ida and how she set you on to the quilting-road. We sure were lucky. Quilt On! Ami, so sorry for your loss of Ida. Both of you were blessed to know each other. I’ve been fascinated, like many, of the Amish ways. Would love to read your thesis. Is that possible? Will be thinking of you in the coming days. Thank you for sharing your story of Ida. What a gift she gave to you and in turn to all of us that know you because of this fine art. May she rest in peace. Big Hugs to you! Such a touching story. How very blessed you were, Ami, to have met Ida & her family. We never know when someone will have a lasting part of our life. Ida will be with you forever. Thank you for sharing with all of us. So glad you enjoyed it! It was wonderful seeing so many of the family again. Thank You Ami for sharing such a wonderful story of your relationship with Ida. Ami, I enjoyed your story…was so very touched. I, too, have always been intrigued with the Amish and their peaceful way of life. 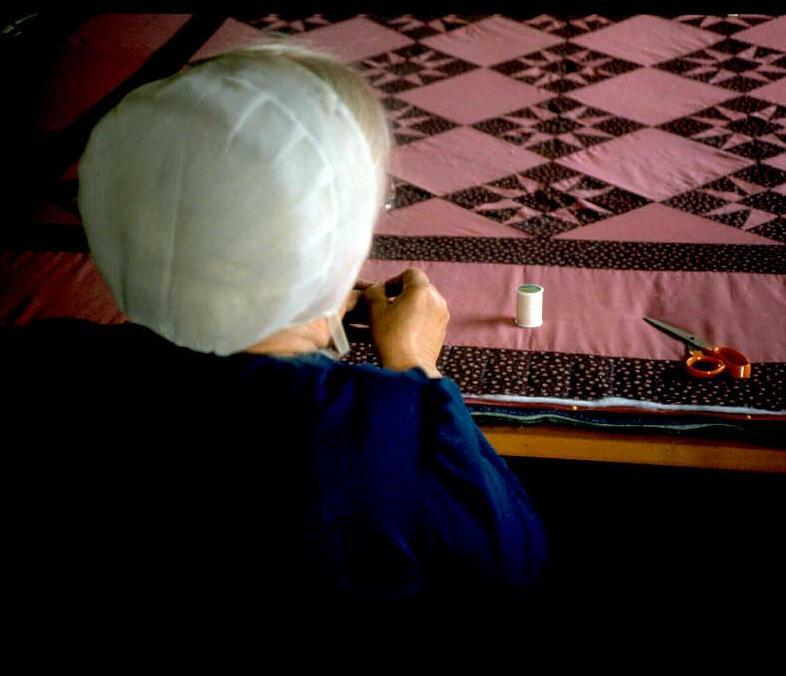 While I’ve done much research and have had the pleasure of purchasing an Amish quilt from a most wonderful lady, I’ve not been able to sit down with them at a quilting. I’m sorry for your friend’s passing, but what wonderful memories you’ll always have.